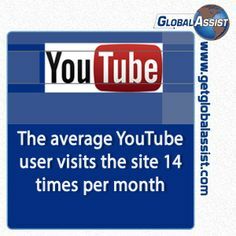 Did you know that the average YouTube visitor visits the site 14 times per month? Do you have an active YouTube Channel? If not, you are missing out. So, if you don’t have a YouTube channel, what are you waiting for? Get yours started today. If you need some help, just give us a call at 888-828-9826, or check out some of our packages that include YouTube creation, as well as video creation to keep your content fresh.